Nemasket Spring, sometimes also referred to as Nemasket Springs, is a series of springs located on the west side of Plymouth Street just north of Muttock. One later owner, Thomas Fielding described it as "hundreds of mineral springs"
Nemasket Spring Water is boiling and bubbling upward from nature’s reservoir as clear and sparkling as heaven’s sunlight. It forces its way through solid beds of porcelain clay, a decomposition of feldspar or kaolin. What can there be more pure than water coming through such a distillatory medium? While undoubtedly the local Natives were aware of and made use of the springs, much of the folklore surrounding them appears to have been an invention of late 19th century marketers who sought to build a long reputation for the spring water rather than historical fact. This farm consists of about 150 acres of very good land, mostly in pasturage and meadow, the grain crop of the present year amounting to only 200 bushels of oats and 100 bushels of corn. The yield of hay, the crop which Mr. Tribou seems to depend upon, is very great, and fills the loft of one of the largest barns in the County. There are cellars under all the buildings, affording ample opportunities for increasing the amount of manure, but which, I cannot but think, are not turned to the best account. There is an abundance of peat on the farm, at a short distance from the stables, which, if thrown into the cellars, might double the amount of manure without damaging its quality. Mr. Tribou’s interest seems devoted to horses, in which he deals largely, and cattle, of which he has about forty head, cows, calves, steers and working oxen. He is of opinion that the Devons, of which his herd consists, are the best adapted to our soil. Hitherto he has found a ready market for all he can raise. His calves at six months old command from fifty to a hundred dollars. He thinks his stock are good milkers. They certainly make the best working oxen and finest beef cattle. Some are full blooded, others grades; but all are entirely red and can scarcely be distinguished from pure Decons. The herd when seen grazing together is a beautiful sight. I saw, also, four fine colts, one of which took first prize in its class at the late County [Fair]. The most promising of them, however, is a young Black Hawk which the owner prizes very highly. Learning that Mr. Tribou has another farm about five miles distant and not far out of my way home, I concluded to take it on my return. This farm consists of about 100 acres, in very rough condition and used only for pasturage. I do not know that Mr. Tribou intends to reduce this place to order, but if he does, I hope he may live long enough to accomplish his work. I think Mr. Tribou deserves much credit for his efforts to establish a regular stock farm in Plymouth County. He is, so far as I know, a pioneer in this enterprise, and it is to be hoped he will meet with that success which will induce others to follow; for without stock no great advance can be made in agriculture. Tribou was highly successful as a master farmer, and as the article quoted above implies, accrued a considerable sum of money from the sale of his stock, particularly horses for which he was noted in dealing. “…His capacious stables were … the mecca for traders the country round.” Cattle, nonetheless, remained an important source of income as well, and to promote his animals, Tribou featured them in local fairs, most notably the Plymouth County Agricultural Fair held each autumn in Bridgewater where the animals consistently were awarded blue ribbons as prize specimens. Through these means, Tribou was able in 1849 to erect a large 14-room house which resembled the George R. Sampson House on Everett Street with its Greek Revival style. Later described as a “pretentious mansion”, it “was one of the most imposing homes in the outskirts of the town. 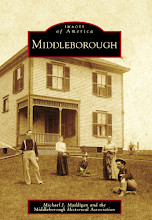 It was of colonial design, of large proportions, with pillars and balcony, and was especially well built.” The house was a landmark on the road from Middleborough to Bridgewater. So notable was the farm, in fact, that the immediate vicinity of the farm situated between Muttock and Warrentown came to be known, for a short time at least, as Tribou and the Tribou Neighborhood. Wealth from the land also permitted Tribou’s son, Nahum, Jr., to attend Middleborough’s prestigious Peirce Academy, Harvard and the Jefferson Medical School, a path typically financially out of reach for most farmers’ sons. 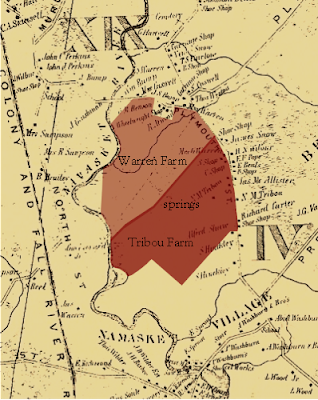 The Nemasket Springs was a feature of the Tribou Farm of which they made great use. About 1850, Nahum Tribou acquired a hydraulic ram which was used to pump water from the spring into his house. The ram was located approximately a quarter of a mile below the house and was powered by water drawn from a small cress-lined brook which flowed from a spring-fed speckled trout pond above the ram and 2,000 feet away. Tribou is said to have filled the troughs on his farm with Nemasket Spring water, a fact which contributed to the Eden-like mystique of the farm at a time when the quality of water used by many people was of questionable purity. 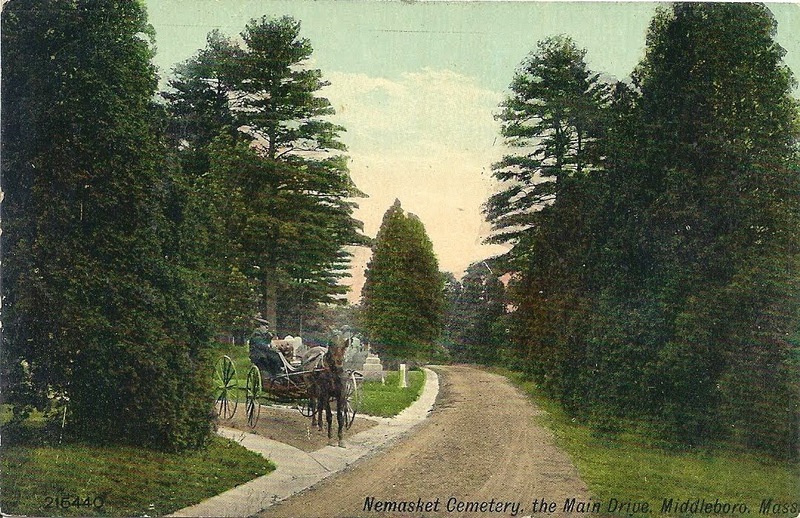 "Tribou had many cattle and horses in this Nemasket Valley, which fattened and thrived on Nemasket Spring Water like babes on a mother's nursing-bottle; at least so say the neighbors." The Tribous are reputed to have been "approached by New York parties who wanted to buy the springs, but failing to do so they returned from whence they came, very much disappointed." Later, an analytical chemist (probably H. Carlton Smith in 1897) described the site as "a regular Saratoga" and suggested that a resort hotel be constructed "so that visitors could have the benefit of the water, the air and the piny woods." The suggestion was not surprising. In addition to Saratoga, other resorts such as Poland Spring and Deer Park catered to the public desire to "take the waters" in the belief that pure spring water acted as a curative for a multitude of ills. The Tribous never formally marketed Nemasket Spring water. Only following 1891 when the Tribou family sold the farm, would efforts be undertaken to commercially develop the springs. Zymotic diseases, such as diphtheria, typhoid fever, dysentery, cholera, etc., are traced to impure drinking-water. Obnoxious air and contaminated water are sure foes to health, and they will quickly impair the vitality of the system, when sickness and death must inevitably ensue, unless a counter-action takes place by at once drinking absolutely pure water, like Nemasket Spring Water. So wrote Thomas C. Fielding of Melrose who in October, 1891, acquired 65 acres of the Tribou property (including the house, outbuildings and springs) for $3,000 from Henry R. Tribou. Renaming the property Spring Brook Farm, Fielding clearly was cognizant of the commercial potential of the springs on his newly-purchased farm. Middleborough hardware dealer George E. Doane later characterized Fielding as possessing “sagacity and [a] keen business instinct”. T. C. Fielding, Esq., Middleborough, Mass. The low amount of total solids (about two grains per gallon) indicates a very pure water, being less than shown by published analyses of the Poland Mineral Spring Water. A microscopical examination was made for fungi and other vegetable micro-organisms, and nothing whatever found except a few amorphous particles. A qualitative examination of the mineral constituents shows them to consist mainly of Calcium or Lime Salts dissolved by the excess of free Carbonic Acid, very little if any Iron or Aluminum, some Silica and Salts of Potassium and Sodium. I do not hesitate to recommend most highly this water for table use. Fielding subsequently appears to have inquired of Smith whether the water could be labeled as “Lithia water”, that is water containing lithium salts. Accordingly, a second sample of Nemasket Spring water was sent to Smith’s Cambridge laboratory for analysis in early 1898. 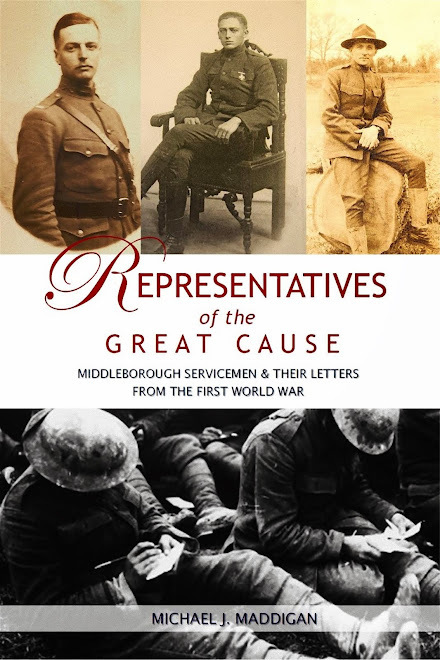 Writing on March 17 to Fielding in Middleborough, Smith revealed that “the qualitative test showed the presence of Lithia very distinctly”. 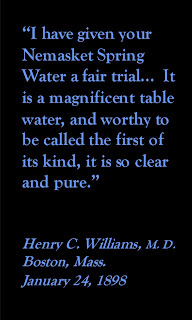 Bolstered by these scientific analyses which seemingly claimed for Nemasket a purity even greater than the well recognized Poland Spring Water, Fielding focused much of his advertising upon the medicinal properties of Nemasket Spring Water: "It takes the place of distilled water in the dispensary, where several druggists use it in connection with physician's prescriptions, as well as in the fountains, wherein it is charged in the usual manner for carbonated drinks. Carbonic acid is formed of one part of carbon and two parts of oxygen." Fielding was also careful to secure the testimonial of at least one physician who touted the purity of the water, thereby giving added clout to the arguments regarding its purity. "Warren Peirce, M. D., of Plymouth says: 'There are no micro-organisms in 'Nemasket Spring Water.'' The human body is made up of four-fifths of water, and requires the purest of nature's liquid to eliminate the impure therefrom. The chemist can analyze the water into its several constituent parts of grains and solids. The physician can say whether it is pure or impure from the analysis. But can they discover that indefinable something, that vital principle, which cures the wound and heals the sore, in the apparently non-existing virtues or remedies appropriate for those very bruises?" With these testimonials, Nemasket Spring Water appears to have been first marketed sometime in 1897. 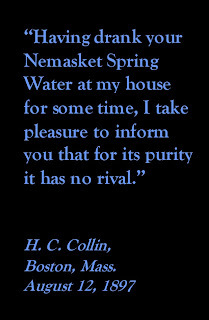 One testimonial letter dated August 12, 1897, reports the author as “having drank … Nemasket Spring Water at my house for some time”, while a second letter dated September 10, 1897, notes Fielding as “now putting your Nemasket Spring Water on the market.” The water was marketed as Nemasket Spring Water and possibly Nemasket Lithia Mineral Water, appearing on record at least once under that name. The spring water was bottled in carboys, large heavy clear glass bottles holding 5 gallons. Patrons returned the bottle to be refilled, as indicated by George W. Holbrook, a conductor with the New Haven & Hartford Railroad Company residing at Provincetown. “I return the empty carboy; please send a full one in its place, and send the bill”, Holbrook instructed Fielding in September, 1897. 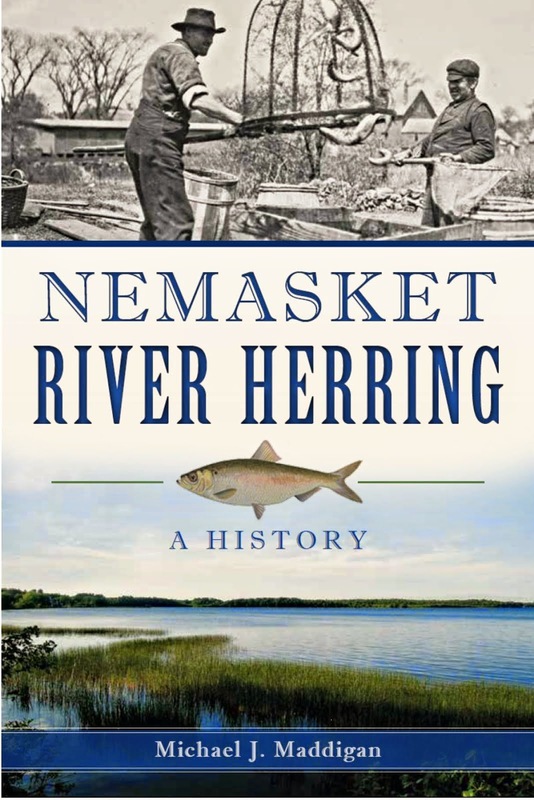 To promote the water, Fielding published a 24-page booklet extolling the virtues of Nemasket Spring Water. In addition to a history of the springs, the booklet included Smith’s chemical analysis of the water, testimonials from Middleborough and other residents and medical professionals, and even poetry. Takers of the water claimed numerous medical benefits: “its effects in kidney and bladder trouble is without a rival” (September 10, 1897), “it has done me a wonderful amount of good on my kidneys” (August 12, 1897), it is “of great assistance in rheumatic cases” (January 24, 1898). Many praised its diuretic qualities. Mrs. Charles McDermott of Brockton claimed to “feel better and stronger” since having started on a regimen including Nemasket Spring Water. No doubt, her raised spirits were attributed to the lithium in the water. 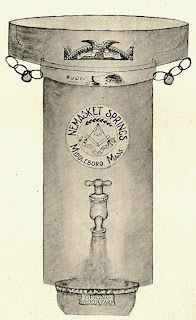 Fielding used a curious mix of scientific analyses, personal testimonials, poorly written poetry, highly imaginative historical imagery and Masonic symbols and mottos to promote Nemasket Spring Water. Perhaps most unique was one of the poems, Pure Water, which Fielding himself penned advertising the water. Or when the night stars gleam. To build the system up. Has made it good for you. So quaff it all you please. It makes you glad within. And that is just the thing. From out the dome of night. In time long since forgot. But He who knows the way. Or drooping soul to raise. The purest of them all. You’ll find it square and true. Please plainly write your name. And paleface does not fear. With hands upon his gun? His friendship had been won. For lack of friendly care. In choicest books for sale. For if desponding He uplifts, If we but mind His ways. Testimonials from prominent patrons of the water also formed an important component of Fielding’s marketing strategy. Coupled with the scientific analyses conducted by Smith, and the praise of local and regional medical doctors, these testimonials helped influence potential customers. Middleborough, Mass., March 14, 1898. MY DEAR SIR: I have used your Nemasket Spring Water on my table for some months, and find it most excellent. It seems to possess qualities peculiar to itself and surpassed by none. It is efficacious, pure and pleasant. Having been familiar with the Springs from my boyhood, and seen the sparkling water bubbling up through nature’s own filter beds, I am not surprised to learn that with your usual sagacity and keen business instinct you have seen in them not only an “honest penny,” but also to confer a public favor. I wish you every success in the enterprise. 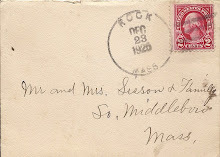 4 Pearl Street, Middleborough, Mass., Feb. 16, 1898. DEAR MR. FIELDING: I have known you personally for the past twenty-eight years, and I take pride and pleasure in writing a few lines in favor of your Nemasket Spring Water, which I have been using in my family for many months. I would not be without the water in my house, for I have found it remarkably refreshing as a table water and a remedial agent, in my rheumatism, of most astonishing efficacy. 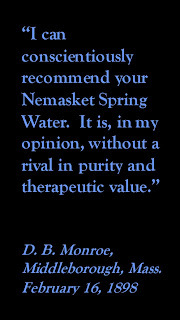 I can conscientiously recommend your Nemasket Spring Water to my friends. It is, in my opinion, without a rival in purity and therapeutic value. If experience teaches anything, I ought to know whereof I speak. The price is so low that all can afford to have it in their homes, which I think will prove a public benefaction. 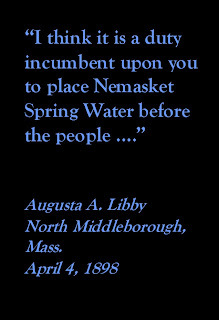 I want you to use this letter in any way pleasing to you, as it is my earnest wish that you may bring successfully before the public the knowledge of your wonderful Nemasket Springs. Middleborough, Mass., March 7, 1898. DEAR SIR: Allow me to express a few words in recommendation of your Nemasket Lithia Mineral Water, which I have drank from the springs themselves, and have used it as a table water in my house. There are seven feet of solid water boiling over night and day, welling up through a decomposition of kaolin, or the finest of mineral clay, and cannot be otherwise than pure and sparkling. The water is a foe to constipation and a diuretic of surely remarkable efficacy. The absence of sediment proves the nonexistence of micro-organisms. The small amount of solids alone fixes its purity. In my opinion it will prove quite an adjunct in the dispensary, also the water of waters for the table. Success to your Nemasket Springs. AMOS P. PAUN, M. D.
5 North Street, Middleborough, Mass., April 3, 1898. DEAR SIR: I have derived considerable benefit from your Nemasket Spring Water. It is a diuretic without any sediment, and a sparkling table water of great purity. Summer Street, North Middleborough, Mass., April 4, 1898. DEAR SIR: Allow me to express my cordial good wishes to your success in placing Nemasket Spring Water on the market. I have drank it at my house for some time, and I can assure you that I have been wonderfully benefitted by it. It seems to possess a most agreeable and permeating quality, which reaches every ache and pain in the body as though a wizard's wand had bid them depart like unwelcome mists at break of day. I think it is a duty incumbent on you to place Nemasket Spring Water before the people; and they are discriminating judges of meritorious articles, especially a water of remarkable efficacy and crystal purity such as yours is. As a table water it is matchless, and in my opinion admits of no comparison with any of the waters now in circulation. It is lovely, soft, sparkling and refrshing; and above all its healing power on myself has been such that I cannot but recommend it to my sisters in affliction as a panacea for their ills, or in health, as an ounce of prevention is worth a pound of cure. I would not be without it in my house under any circumstances. It is nature's own remedy and earth's choicest distillation from the great Creator's laboratory. I endorse the above. CLARENCE E. LIBBY. 73 Everett Street, Middleborough, Mass., April 7, 1898. DEAR SIR: A few weeks ago I was sick with torpidity of the kidneys, which caused blood-like urine and much sediment, but my physician, Dr. paun of this town, prescribed your Nemasket Spring Water, and long before the five-gallon glass carboy was empty I was able to go out to work again. Activity of the kidneys was restored, and the urinary flow was of crystal clearness. I have had several five-gallon carboys since for table water, and my wife says it is lovely. I say so, too, and wish you every success in placing so great a healing medium before the people. 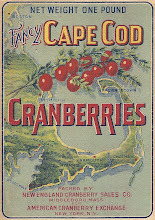 Despite the many glowing testimonials in favor of the water, and the apparent local success it had, on July 14, 1902, Fielding sold Spring Brook Farm to Emily G. Fillmore. It is not clear what prompted Fielding's decision to sell not only the farm but the springs, as well, though money may have been a factor. In 1916 it was written that since Nahum Tribou's death, "the property has steadily declined" although it "retained much of its pristine beauty". Further, though he aggressively promoted Nemasket Spring Water, Fielding may have regarded the mineral water as a sideline rather than a profession. Both the 1895 and 1901 directories of Middleborough list his occupation as that of "steel engraver and chart publisher", rather than bottler. The Fillmores, too, appear to have been uninterested in the water, preferring to farm the property. Their tenure, however, was brief. On March 1, 1905, Mrs. Fillmore sold the 65 acre homestead, including, house, barn, stable and springs to Rodman H. and Caroline B. Robinson of Scoharie, New York. 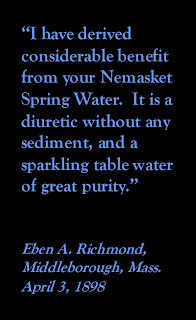 Though Robinson's principal occupation was real estate, (he worked as an agent of the Strout Farm Agency while in Middleborough), he, like Fielding before him, recognized the commercial potential of the springs and he immediately became “interested in the production and sale of Nemasket mineral spring water.” To establish the spring water on a more professional basis, Rodman formed the Nemasket Spring Water Company with himself as president and treasurer, and Dr. A. C. Wilbur of Middleborough as secretary. 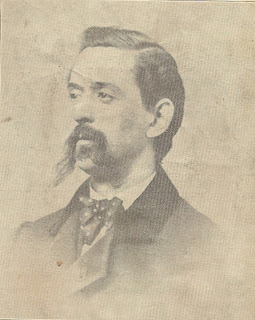 Rodman, Wilbur and Middleboro Gazette editor Lorenzo Wood served as the company’s directorate. The company was initiated with $25,000 in capital stock, which, in 1906, was increased to $100,000. To promote his water, Robinson took advantage of local events. In 1913, when war games were held in the vicinity, Robinson furnished water to the camps at Tispaquin Pond and Fall Brook. The business venture abruptly ended on the early morning of February 26, 1916 when fire destroyed the house and buildings on the property. Headlined under “Destructive Fire at Warrentown”, the Gazette on March 3, 1916, recounted the destruction of what had once been a showplace. Fire completely destroyed the Rodman H. Robinson place at Warrentown at an early hour Saturday morning, the house, barns and sheds being burned flat to the cellars. The blaze was discovered shortly after 4 o’clock by Mrs. Robinson, who, barefooted and in her night attire, with her four children, ran through the mud to the home of Edward E. Place, across the street, to give the alarm. The fire then was in the rear of the barn, but it worked its way through the connecting buildings and three hours later all the buildings were in ashes. 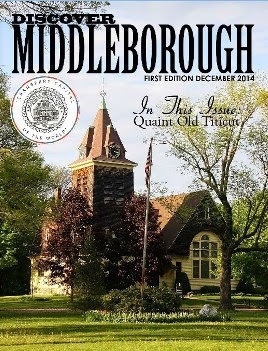 The fire department was called but on account of the vote passed at the last fire district meeting, Chief Maxim could not take the apparatus out of the district [which covered Middleborough Center only] …. Had the apparatus been allowed to go the house could have been saved. The loss was estimated at $6,000, although “a much higher amount would be required to replace” the destroyed buildings. The cause of the fire was unknown. With the loss of the buildings, the Robinsons sold the property in late 1916 to D. Janion MacNichol of Boston and removed to Quincy. In February, 1919, Margaret G. Kayajanian [Kayajan] acquired the property, and it was under the Kayajan family that the springs would gain their greatest fame. 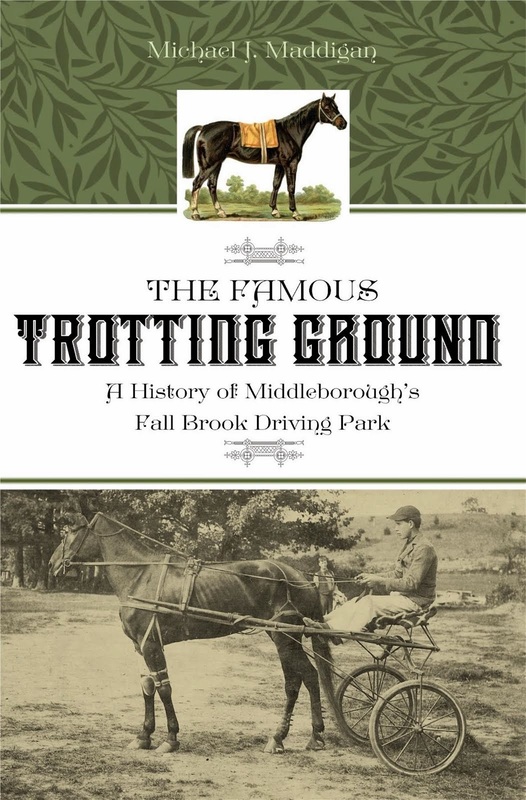 Tribou was widely known throughout southeastern Massachusetts for not only his model stock farm, but also for his skill in horse trading. Through both businesses, Tribou was able to accumulate a sizeable sum of money. Tribou House, Plymouth Street, halftone from an original photograph, published in Nemasket Springs promotional booklet (Middleborough, MA: Thomas C. Fielding, c. 1898). 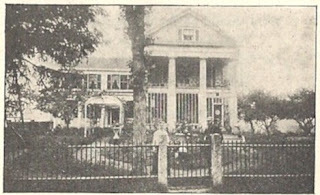 The house is pictured at the time when it was owned by Thomas C. Fielding. Though later chroniclers had indicated that the property had declined since the death of Nahum Tribou, the photograph reveals a still striking and well-kept home. Built in 1849, the house featured water pumped directly from Nemasket Springs. It was destroyed by fire in 1916. 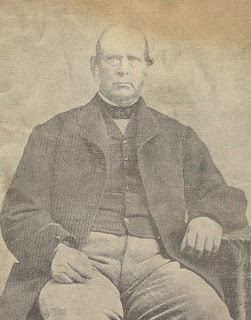 Nahum M. Tribou's son Henry succeeded to the family farm and livery business at Warrentown. "Although he was an excellent judge of horseflesh he was not the successful business man his father was. He was well known and popular among his contemporaries, an enthusiastic sportsman and an agreeable companion." Nemasket Spring Fountain, drawing, published in Nemasket Springs promotional booklet, op cit. This idealized version of the Nemasket Spring fountain shows the Masonic emblems and motto which Fielding used to help promote the water. Nemasket Spring logo, published in Nemasket Springs promotional booklet, op cit. 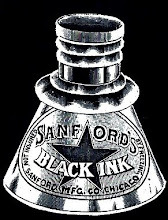 This logo was used on a number of promotional items by Fielding. The numerous testimonials regarding the purity of Nemasket Spring Water was summarized simply in the Latin motto aqua pura. Drawing, published in Nemasket Springs promotional booklet, op cit. 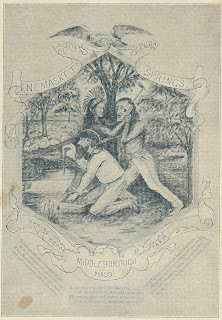 This drawing (and others similar to it) were prepared for Fielding in order to reinforce the tenuous historical connection between the local Native American population and the Nemasket Springs. While such a connection certainly existed, many of the stories surrounding the springs' early history appear to have been fabricated as a marketing ploy, and little is known of the tru history of the springs prior to the 19th century. Nemasket Springs seal, published in Nemasket Springs promotional booklet, op cit. 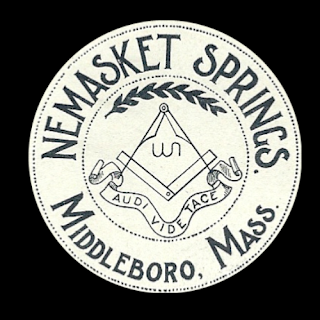 Like Fielding's other promotional material, the seal which he developed for Nemasket Springs featured Masonic imagery. Map of the Town of Middleborough, Plymouth County, Mass. H. F. Walling, 1855, detail showing the Tribou Farm. At its greatest extent in the mid-1800s, the Tribou Farm occupied a large swath of land between Plymouth Street and the Nemasket River. In the 1860s, the large northern (pale pink shaded) portion was sold to Charles S. Stratton (better known as General Tom Thumb). The southern (dark pink shaded) portion which included Nemasket Springs remained in the Tribou family until 1891 when it was acquired by Thomas C. Fielding. Nemasket Springs [promotional booklet]. Middleborough, MA: T. C. Fielding, c. 1898.